horizon memory craft 9400 review... — hello, y'all. many of you know my quilting history, but i don't think i've ever told anyone about how i went about acquire my first "big boy" sewing machine. i had just discovered the modern quilting movement and knew i would need a sewing machine to match my new found obsession. i started my research by seeing what brands quilters were using. as you can imagine, it was mixed. one name, however, was out pacing everyone--janome. so with a little more research (that included reading hundreds of reviews), i knew janome was for me. knowing i wanted a machine with little to no extra features, i started to narrow down the models. and there she was, the DC2012--the brand's beginner-esq model. compact, computerized, and lightweight, it was the perfect introduction into the world of modern sewing and quilting. to this day, she still purrs like a kitten. fast forward to today and janome is still one of my favorite sewing machine brands. the janome horizon memory craft 9400 is no exception. designed with the quilter in mind, this machine is a dream with features like a sizable sewing bed, modern design, and other top of the line key features. janome's accu feed (TM) is worth it's weight in gold! they've added additional white bright LED lighting so you can see your projects more clearly, it's super quiet, and even comes with it's own sewing table (woohoo!). 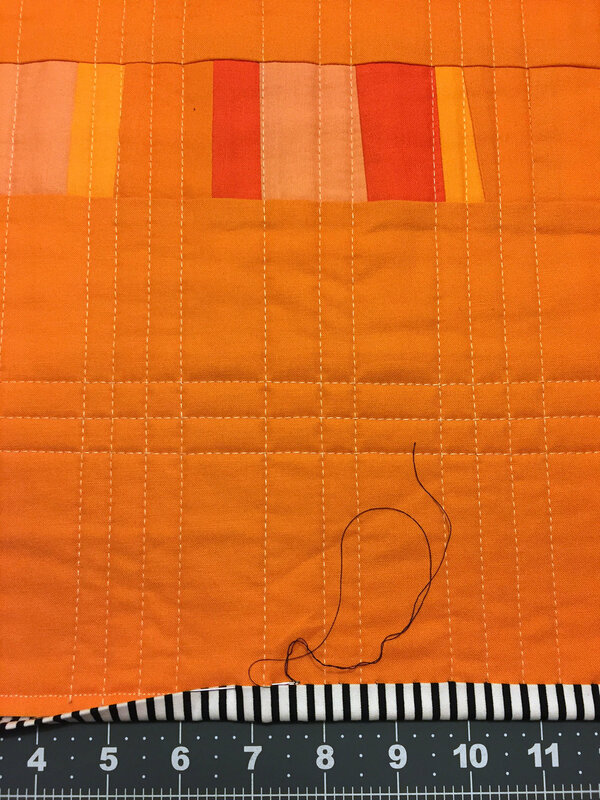 (4) shades of orange in either fat quarters or scraps. i used kona solids. (1) half yard for the background fabric and backing. (1) fat quarter for the binding. (1) 16'' x 16'' piece of batting. 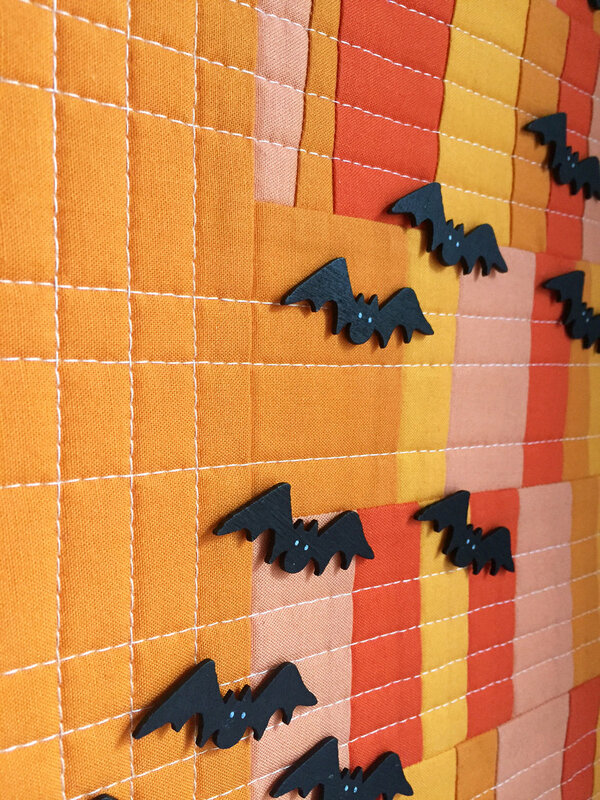 (1) package of tiny wooden halloween bats. i purchased mine from michael's. 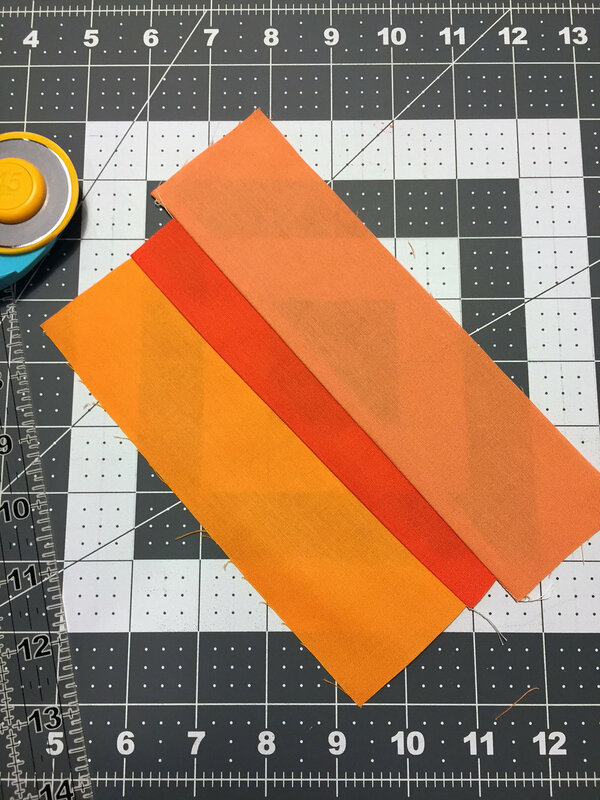 cut the orange fabric into various size strips from 1- 1/2'' to 3'' wide by at least 4 1/2'' long. mixing the shades and sizes, sew the strips together on an angle. trim 1/4'' seam allowance and press the seams to one side. 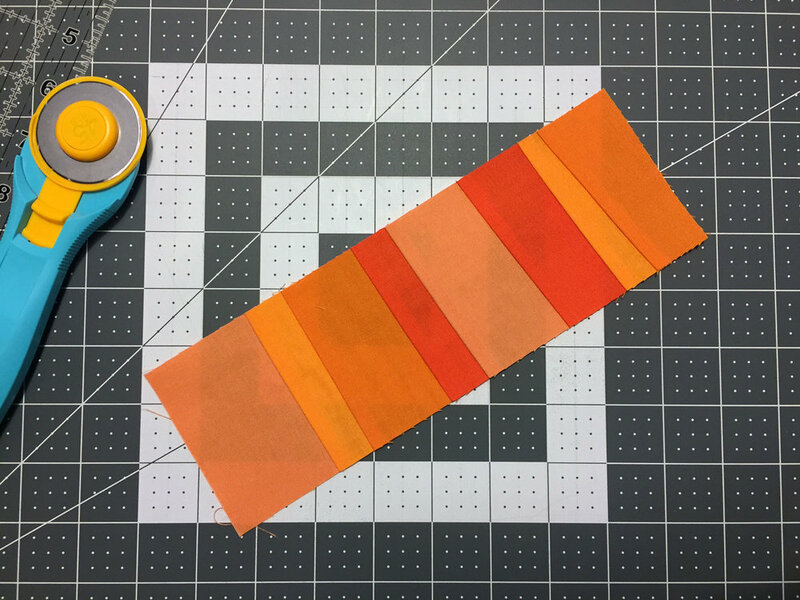 continue sewing the strips together, alternating the angle until you've sewn 9 together. 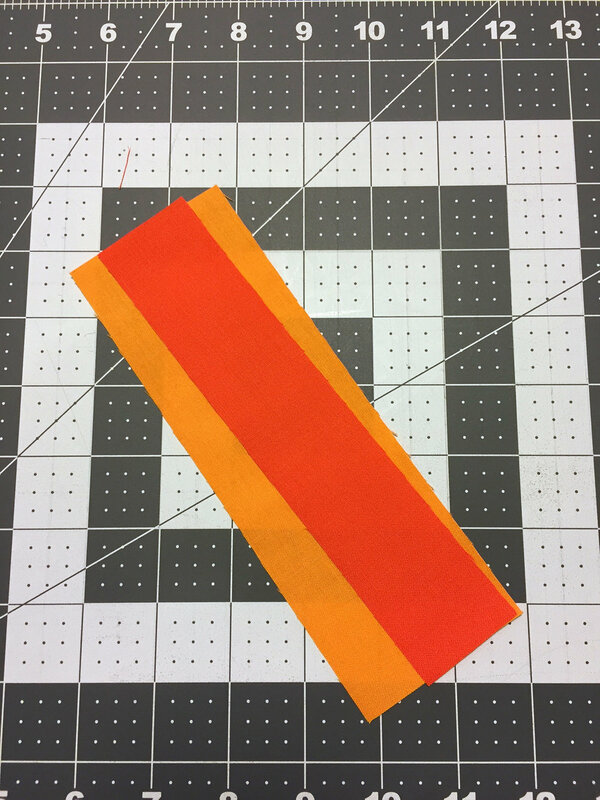 trim, making a 3-1/2'' x 9-1/2'' rectangle. you need (5). cut and sew (1) 5-1/2'' x 14'' rectangle to the left side of you strip blocks. add backing and batting, finish as desired. 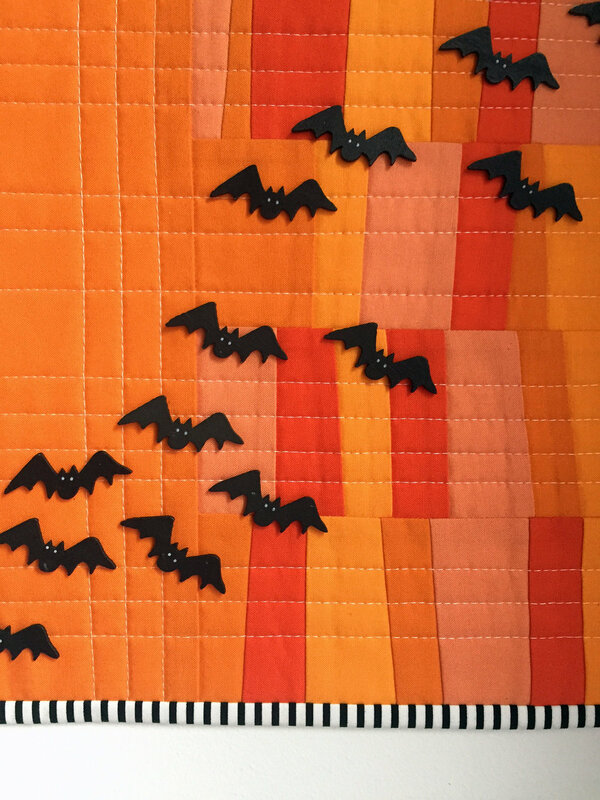 i attached the spooky bats with fabric glue after adding the quilting and binding. isn't this cute? i hope you've enjoyed my review of the janome horizon memory craft 9400 and my fun halloween tutorial. for more information on the machine, visit janome online or your local janome dealer today! p.s. the sewing machine i used is on loan from my friend at janome. all views and opinions expressed are my own, but i highly recommend janome and their wide array of products.